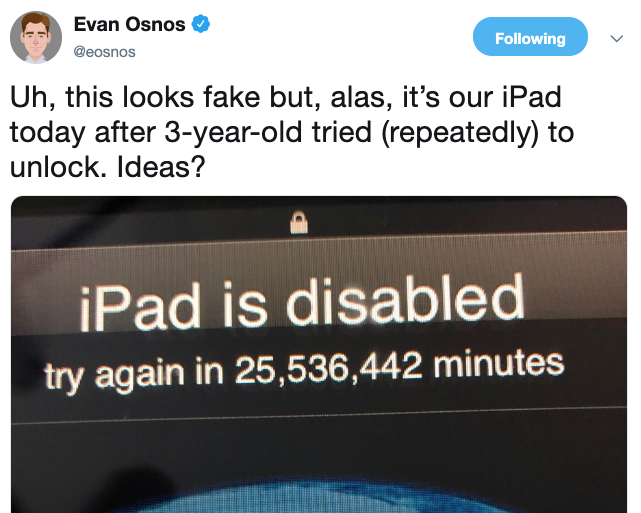 Evan Osnos, staff writer from The New Yorker, recently tweeted out an image of his iPad being disabled, due to his 3-year old toddler. What happened? His 3-year old tried ‘repeatedly’ to unlock his iPad, but with iOS passcode attempt fails, the device will lock you out for long periods of time. In this case, Osnos’ iPad screen said to “try again in 25,536,442 minutes,” or 48.5 years. This means you’ll require a Mac or PC with iTunes to restore your device by putting it into recovery mode. An easier and faster way without iTunes is to use Find my iPad and wipe your device remotely. 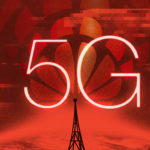 This is all assuming your iPad has been backed up with iCloud or a computer recently, otherwise your data is gone for good. TidBITS has a great write up on restoring your iPad for people in a situation like Osnos. Osnos’ Twitter replies to his tweet are hilarious, with many suggesting for him to leave the iPad as is for his kid’s 51st birthday, to just wait it out and also to ‘reboot your 3 year old’. This is yet another reminder to back up your devices in the event of freak iOS emergencies like this.